Alex Varone of College Basketball Daily is the RTC correspondent for the CAA and MAC. In 2010, the Colonial Athletic Association represented itself well in March, sending a league-record six teams to the postseason. That group was led by league champion Old Dominion, who advanced to the NCAA Tournament’s round of 32 after upending Notre Dame. Both second-place Northeastern and third-place William & Mary fell in the first round of the NIT in a pair of close road losses at Connecticut and North Carolina, respectively. Fifth-place VCU swept Saint Louis in a best-of-three final to win the third annual CBI tournament, while seventh-place Hofstra fell in the CBI’s first round, and fourth-place George Mason lost its first game in the CIT. Two of the CAA’s twelve teams will be under the direction of a new coach in 2010-11. Tom Pecora left Hofstra after nine seasons to lead the rebuilding effort at Fordham. Replacing Pecora is not Tim Welsh, like it was originally intended, but rather Mo Cassara, a first-time head coach who spent the last four seasons under Al Skinner at Boston College. UNC-Wilmington also made a coaching change, “reassigning” four-year head coach Benny Moss within the athletic department. The Seahawks’ new head man is the well-traveled Buzz Peterson, who has already made stops at Appalachian State (twice), Tulsa, Tennessee, and Coastal Carolina. For the second consecutive year, a Virginia Commonwealth Ram was selected in the first round of the NBA Draft, this time being First Team All-CAA center Larry Sanders, who elected to forgo his senior season at VCU. Even with the loss of Sanders, the Colonial boasts a wealth of returning talent, especially at the guard spots. 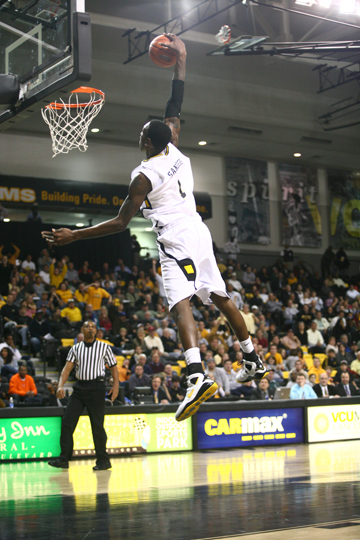 Two members of last year’s First Team are back, led by 2010 CAA Player of the Year and senior Charles Jenkins. Northeastern’s senior guard Chaisson Allen is also back, along with four seniors who made the 2010 Second Team: Delaware guard Jawan Carter, George Mason guard Cam Long, VCU guard Joey Rodriguez, and James Madison forward Denzel Bowles. Old Dominion [27-9 (15-3)] – The Monarchs look to make it back-to-back Colonial Athletic Association championships this season. Leading scorer and First Team All-CAA forward Gerald Lee is gone, but four starters from last year’s title team are back, led by 6’8 senior forward Frank Hassell (9.2 PPG, 6.7 RPG). Hassell anchors a frontline that will once again be Old Dominion’s strength, a luxury in a league that doesn’t feature much frontcourt depth. Teaming with Hassell are a pair of seniors: the versatile Ben Finney (8.8 PPG, 5.8 RPG) and Keyon Carter (7.4 PPG, 4.9 RPG). There are question marks about the guard play, but there are worse alternatives in this league than junior Kent Bazemore (8.4 PPG, 4.2 RPG), a defensive specialist, and senior Darius James (7.0 PPG). Head coach Blaine Taylor has done a great job in leading the Monarchs to seven straight winning seasons and six straight postseason appearances, and while a number of teams are capable of winning the Colonial this year, Old Dominion is once again the team to beat until someone knocks them off. VCU [27-9 (11-7)] – In year one of the post-Anthony Grant & Eric Maynor era, VCU won 27 games, second-most in school history, reached the postseason for the fourth consecutive year, and won the CBI tournament. Not bad for what was supposed to be a “transition year” at Virginia Commonwealth. This year, the Rams have to deal with the heavy loss of First Team All-CAA center Larry Sanders, who finished in the top five in the league in rebounding, blocked shots, and field goal percentage. The burden of some of that production will fall on the shoulders of 6’9 senior Jamie Skeen (8.1 PPG, 4.5 RPG), but expect the 2010-11 Rams to be a guard-oriented squad. Second Team All-CAA senior Joey Rodriguez is the top returning scorer (12.9 per game), but also led the CAA in assists (5.8 per game) and steals (1.9 per game). Seniors Brandon Rozzell (8.8 PPG), Ed Nixon (7.9 PPG), and wing Bradford Burgess (10.4 PPG, 5.1 RPG) should all see increased production this year. VCU was a bit unfortunate in close games last year, as all eight conference losses were by five points or fewer, including a four-point overtime loss to Old Dominion in the CAA Tournament semifinals. If a few of those close losses go the other way in Shaka Smart’s second year, VCU could very well be headed back to the NCAA Tournament. George Mason [17-15 (12-6)] – In 2010, George Mason showed flashes of being a league contender; a seven-game win streak last January left the Patriots with a 15-7 (10-1) record, but they lost eight of their last ten games, and subsequently bowed out in the CAA quarterfinals. But all five starters are back this season, led by senior guard Cam Long (12.2 PPG, 3.9 RPG, 3.1 APG, 1.3 SPG), a 2010 Second-Team All-CAA performer and 2011 Player of the Year candidate. Long will be complemented by a trio of juniors in forward Ryan Pearson (11.9 PPG, 6.4 RPG), guard Andre Cornelius (9.4 PPG), and forward Mike Morrison (8.5 PPG, 5.9 RPG, 1.6 BPG). If forward Luke Hancock (7.7 PPG, 3.5 RPG) and guard Sherrod Wright (5.5 PPG) can both blossom as sophomores, this could be one of Jim Larranaga‘s most talented teams and the most talented team in the CAA. As is, George Mason will likely be more consistent in 2011, and with that, the Patriots should be considered one of the favorites. Hofstra [19-15 (10-8)] – What started with a fairly ordinary coaching change turned into a tumultuous start to the offseason at Hofstra. The Pride made what looked to be a good hire in former Iona and Providence head coach Tim Welsh to replace the Fordham-bound Tom Pecora, but one month into his tenure, Welsh was arrested for drunken driving and subsequently resigned, leaving former Boston College assistant Mo Cassara as Hofstra’s third head coach in a little over a month. In his first season on the job, Cassara has the good fortune of having 2010 CAA Player of the Year Charles Jenkins (20.6 PPG, 4.5 RPG, 3.9 APG, 1.8 SPG) to build around. Last year, Jenkins led a team that won 10 of its last 13 games, only losing to Northeastern twice (the last being a 2OT CAA Tourney Quarterfinal), and to IUPUI in the CBI’s first round. This year, the Pride should expect key contributions from senior wing Nathaniel Lester (8.0 PPG, 4.8 RPG) and senior forward Greg Washington (6.6 PPG, 6.2 RPG, 2.8 BPG), but make no mistake, this Hofstra team will go as far as Jenkins can take it. James Madison [13-20 (4-14)] – Last year, the Dukes were not your typical 11th-place CAA squad; injuries and inconsistent play doomed James Madison from the start. When healthy, third-year coach Matt Brady has one of the most talented rosters in the entire league. Senior forward and Texas A&M transfer Denzel Bowles was a Second Team All-CAA selection last year, and led the conference in scoring (20.8 points per game), rebounding (9.2 per game), and field goal percentage (59.4%). Joining Bowles to form the most explosive offensive duo in the CAA is sharpshooting junior forward Julius Wells (16.3 PPG, 5.1 RPG, 91 3PM). James Madison fans will be glad to see sophomore guard Devon Moore (10.7 PPG in 2009) back after missing all of last season with a knee injury. Overall, this is a young roster – Bowles is the only senior – that will score a lot of points, and could be a sleeper contender in 2011. William & Mary [22-11 (12-6)] – William & Mary came oh-so-close to its first ever NCAA Tournament appearance in 2010. The Tribe compiled a tremendous non-conference resume, with early-season wins over Richmond, at Wake Forest and at Maryland. A few tough conference losses knocked them out of at-large discussion, but William & Mary still made it all the way to the CAA Tournament Championship Game before falling to Old Dominion by seven. The Tribe had to settle for a trip to the NIT (only the second postseason appearance in school history) and Tony Shaver was named CAA Coach of the Year. With the loss of double-digit scorers David Schneider and Danny Sumner, W & M is likely to take a step back this year, but this is still a quality team that will be in the thick of the CAA race thanks to the contributions of junior swingman Quinn McDowell (13.9 PPG, 4.3 RPG) and the lone senior on the roster, forward Marcus Kitts (7.0 PPG, 6.3 RPG). Northeastern [20-13 (14-4)] – It wasn’t an easy road to a 20-win season, second-place CAA finish, and NIT appearance for Northeastern. A poor non-conference start doomed any potential at-large chances and left the Huskies with a 2-7 overall record on Christmas morning. Northeastern then proceeded to roll off 15 wins in its next 16 games to get to 17-8 (12-2) and establish themselves as a league title contender. But Northeastern fell short of that goal, losing in the CAA Tournament Semifinals as part of a season-ending stretch of five losses in eight games. The core of last year’s team – guards Matt Janning and Baptiste Bataille, with forwards Manny Adako and Nkem Ojougboh – is gone, leaving steady guard Chaisson Allen (13.6 PPG, 4.7 RPG, 3.6 APG) to carry the offense as a senior. Allen is a star, and is capable of winning some games by himself, but sophomore wing Alwayne Bigby (3.2 PPG) is the only other returning starter on a team that lacks any real depth, and as a result, is likely to fall back to the middle of the CAA pack in 2011. Delaware [7-24 (3-15)] – Things are looking up for 2010’s last place finisher, and fifth-year coach Monte Ross might just need to lead the Blue Hens to a big season in order to save his job. The top seven scorers from last season are back, led by seniors Jawan Carter (18.2 PPG, 3.3 RPG, 4.9 APG) and Alphonso Dawson (12.1 PPG, 6.0 RPG). Delaware will also get a boost from senior guard Brian Johnson, who missed all of last season, but was a consistent 10-point, 5-assist performer in 2009. Those three seniors form a solid veteran core, and there is also a nice mix of youth in sophomore forwards Kelvin McNeil (6.0 PPG, 6.2 RPG) and Jamelle Hagins (5.4 PPG, 5.3 RPG), both of whom are potential breakout players in 2011. Delaware won’t be in the CAA cellar this year, but to expect this group to go from last place to a title contender might be too much to ask for. Towson [10-21 (6-12)] – A 59-point loss at VCU on January 27th left the Towson Tigers with a 4-16 (1-9) record, a host of questions about their talent and heart, and all the makings of a lost season. You can’t ignore over 20 losses, but following the embarrassing performance at VCU, the Tigers ended the season on a high note by getting to six CAA wins in the regular season and won their first round game in the CAA Tournament for the fourth consecutive year. Even with last year’s top two scorers gone, Towson has some quality pieces in place, led by senior Robert Nwankwo, a nightly double-double threat (9.9 PPG, 8.9 RPG) who also led the league in blocks (3.1 per game). Junior guard RaShawn Polk (9.2 PPG) is a blossoming scorer, and fellow junior Troy Franklin (8.3 PPG, 3.7 APG) is one of the Colonial’s best point guards. 6’7 forward Isaiah Philmore (6.4 PPG) is a talented sophomore and a player to watch this season. Coming off back-to-back 20-loss seasons, this team isn’t really a true contender, but there is enough upside here for Towson to potentially challenge for its first winning season under seventh-year head coach Pat Kennedy. Drexel [16-16 (11-7)] – Over the past three seasons, Drexel has recorded only one winning season and notably hasn’t reached the level of play that very nearly landed the Dragons in the 2007 NCAA Tournament. The pressure on tenth-year head coach Bruiser Flint is rising, especially after an offseason robbery incident involving guard Jamie Harris and forward Kevin Phillip, which landed both of them off the team. Even with the loss of Harris, the Dragons will have to rely on their backcourt to win games this season. Senior Gerald Colds (9.3 PPG) is a steady scorer, and sophomore Derrick Thomas (6.4 PPG) should see his minutes and production increase out of necessity. But fellow sophomore and 2010 CAA Rookie of the Year Chris Fouch (11.3 PPG) is a star in the making and will likely need to be the go-to option this season. Unfortunately for Drexel, there just aren’t a lot of capable big men on this team, with the exception of junior Samme Givens (8.3 PPG, 8.3 RPG). Flint has some quality players, but this team lacks depth, and with the cloud of the offseason controversy hanging over this team, it’s hard to envision Drexel getting back to its winning ways in 2011. UNC Wilmington [9-22 (5-13)] – New head coach Buzz Peterson’s latest rebuilding effort takes him to the CAA and Wilmington, NC, to try and revive a program that has suffered back-to-back 20-loss seasons and has seen its fan base grow increasingly disillusioned. Peterson has a history of producing quick results and then moving on to the next best opportunity, but Seahawk fans shouldn’t expect to see a dramatic turnaround in Peterson’s first year. Wilmington returns three starters, including senior guard Chad Tomko (12.8 PPG, 4.3 APG), a serviceable lead scoring option, but nonetheless is a player who has had his character questioned in an up-and-down relationship with the Seahawk fanbase. Senior guard Ahmad Grant (8.1 PPG) is also back, but a decent backcourt won’t overshadow the glaring holes in the middle. Sophomore Keith Rendleman (5.9 PPG, 6.1 RPG) is the best post presence, but there are too many pieces missing from this team to expect much in the way of improvement in 2011. Georgia State [12-20 (5-13)] – In all three years of coach Rod Barnes’s tenure, Georgia State has recorded a 20-loss season. With their top five scorers from last year gone, look for the Panthers to extend that streak to four. The lone returning starter is senior guard Marques Johnson, who only averaged 2.6 points and 2.3 assists per game. Junior guard Jahad Ali (5.4 PPG) is the highest returning scorer, and will likely have to be the offensive centerpiece this season. The rest of the roster, especially the forwards and centers, are junior college transfers and other relative unknowns. Georgia State was already the worst scoring offense in the Colonial last year at a little over 62 points per game; a number that almost certainly will not improve in 2011. Unless there is a hidden gem or two on this roster, Georgia State – and Barnes – are in for a long season. A number of CAA squads will get a chance to face off against the nation’s top teams and potentially pick up some quality non-conference wins in various tip-off tournaments around the nation. James Madison is participating in the CBE Classic, where it has a brutal regional round game at Kansas State on November 12th. Hofstra will take on the re-tooled North Carolina Tar Heels in the Puerto Rico Tip-Off on November 18th. VCU could potentially face Wake Forest in Winston-Salem in the early rounds of the NIT Tip-Off. George Mason is in the Charleston (S.C.) Classic, which will field the likes of Georgetown, NC State, and Charlotte. Lastly, Old Dominion will head to the Virgin Islands to take on St. Peter’s in the Paradise Jam, an event that also includes Xavier, Alabama, Seton Hall, and Clemson. The question that should be on the minds of every CAA basketball fan is: can the Colonial be a multi-bid league? It was in 2006 (UNC Wilmington, George Mason) and 2007 (VCU, Old Dominion); in fact, it was nearly a three-bid league in both years as Hofstra (2006) and Drexel (2007) narrowly missed the NCAA Tournament field. But in each of the last three years, the CAA has landed only a single bid to the dance, and Old Dominion’s first round win last year was the conference’s first NCAA Tournament victory since VCU upset Duke in 2007. With the overall amount of talent returning, this could be the year the CAA sees multiple bids and even multiple wins in the NCAA Tournament. This entry was posted on Wednesday, September 8th, 2010 at 11:14 am by Brian Goodman	and is filed under summer school. Tagged: alphonso dawson, blaine taylor, bruiser flint, buzz peterson, cam long, chad tomko, chaisson allen, charles jenkins, delaware, denzel bowles, devon moore, drexel, frank hassell, george mason, georgia state, gerald lee, hofstra, james madison, jamie harris, jawan carter, jim larranaga, joey rodriguez, kevin phillip, larry sanders, matt brady, Mo Cassara, northeastern, old dominion, pat kennedy, quinn mcdowell, RaShawn Polk, Robert Nwanko, rod barnes, tim welsh, tony shaver, towson, unc-wilmington, vcu, william & mary. You can follow any responses to this entry through the RSS 2.0 feed. You can leave a response, or trackback from your own site.